Once again, it’s time to see my favorite sign of spring…not birds chirping, or green buds appearing, or flowers blooming, although after this winter I am glad for all these things. This March 22nd is the 22nd annual United Nations World Water Day, the holiday when the UN seeks to raise awareness and address the importance of freshwater, among many other resource related issues throughout the world. This year’s theme is “Water requires energy, and energy requires water,” which will explore the relationship between water and energy. Roughly 75% of industrial water is used for the production of energy, and 8% of energy is used to transport, pump, and treat water worldwide. 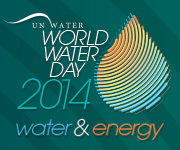 Water and energy are two of the most needed resources in the world, and on World Water Day the United Nations will not just view the water and energy policies of the world, but work to change the ineffective aspects of previous policies to better govern the water of the world. Along with raising awareness, the UN looks to develop and maintain relationships with the stakeholders involved with water and energy sectors, so they can work together to increase the bond between the two resources throughout the world. Every day I’m reminded how energy and water are inextricably linked. Because water must move through many process steps before it reaches customers’ taps, public water supply and treatment is one of the world’s most energy-intensive systems. Before it reaches the consumer it has typically been pumped from the source to the treatment facility, where further energy will be used in the treatment process. Throughout the process, there can be additional inefficiencies if water is lost in the system due to leaky pipes. Once in peoples’ homes and businesses, there is more energy used in order to heat water for showers, washers, cooking, and more. The water industry has an overarching goal to reduce the energy footprint expended by water services. Reducing the energy intensity of water services achieves several goals at once, including bringing down costs and operating expenditures, and reducing greenhouse gas (GHG) emissions that impact climate change. We announced our own goal in 2009 to lower GHG emissions per volume of water produced by 16 percent from 2007 levels by the year 2017. We have had a number of programs in place to meet this goal – which we actually did in 2012! – but our primary focus was, and continues to be, improving the energy efficiency of the water pumping process, which accounts for approximately 90 percent of GHG emissions. Additionally, water conservation represents an important opportunity to reach substantial energy savings and is consistent with our vision of more sustainable water management. A water and energy problem anywhere is a water and energy problem everywhere. You can see what you can do to help raise awareness by going to http://www.unwater.org/worldwaterday. The links between water and energy can make a big impact in the lives of people across the world, and improving water and energy efficiency is imperative as are coordinated, coherent and concerted policies. Better understanding between the two sectors of the connections and effects on each other will improve coordination in energy and water planning, leading to reducing inefficiencies. Policy-makers, planners and practitioners can all take steps to overcome barriers that exist, and innovative and pragmatic national policies can lead to more efficient and cost effective provisions of water and energy services.